Are you one of those wondering why there’s no confirmation dialog box prompt when you delete files on Windows 10 computer or laptop? Yes, I’m sure you all miss those delete file message asking “Are you sure you want to delete…” before the file goes to recycle bin. The case on Windows 10 is by default this prompt is not enabled, you need to set it by yourself after you install the OS. I’m sure you start thinking where to enable that options on your new PC. Here’s how to make your Windows 10 ask prompt when you delete a file. Right click Recycle Bin, then select Properties. On Recycle Bin properties, mark check box “Display delete confirmation dialog”. Click Apply then OK to save changes made. That’s it. 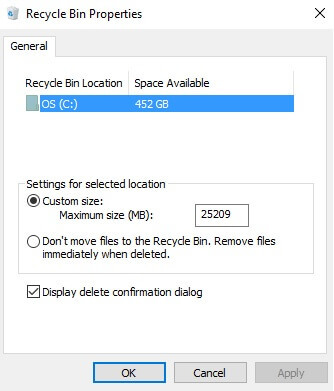 On the same window you are also given an option to remove the files immediately when you delete it from your computer by ticking the button “Don’t move files to the Recycle Bin option. If you want to retain or store deleted files before doing a permanent delete you can tick “Custom size” and set maximum storage space allowed to be stored.